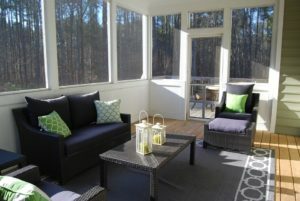 A sunroom is an outdoor living room added on a wood or concrete home foundation. The addition of a sunroom to your home opens up the living space to beneficial sunlight that pours into the room through glass windows. Other terms for a sunroom include solarium, Florida room, and patio enclosure. Single and double-pane glass windows not only invite the sun into your home, the protective shields also keep out wind, rain, and pesky bugs. Our team of experienced home improvement professionals will work closely with you to create the perfect sunroom design for your home. We meet with you to discuss the design options that fit within your home improvement budget. Whether you go with single or double pan glass windows, any sunroom design you decide on should seamlessly match the interior décor of your home. After initial conversations that determine the design of your new sunroom, our talented team of trade professionals gets busy preparing a step-by-step game plan for making your home. You hear the terms three-season and four-season sunrooms often. As the terms imply, we offer sunrooms that work during three or four seasons. Three-season sunrooms typically do not offer homeowners benefits during winter. The benefits of installing a sunroom include lower monthly energy bills and additional space that offers you more interior design flexibility. Sunrooms create the ideal space for workout and/or meditation rooms. Turn a sunroom design into a green room where you grow plants under more than enough daily sunlight. We consider adding a sunroom to represent one of the most effective ways to increase living space within your home. You just have to hire the best home remodeling company to get the job done right.